Do you know the Local SEO Search Importance For Improve Your Brand Visibility Online. 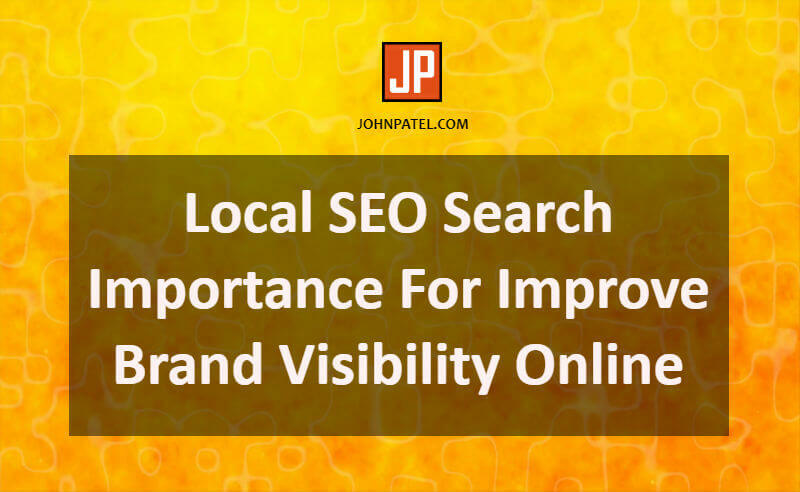 In this article, we will discuss the Local SEO search importance and How we can improve our brand visibility online? Local SEO is the best way to promote your business online. So, You can get more local customer’s awareness for your services and products. If you want to make your site ranked on search engines like google, bing then you have to use Local Search Engine Optimization. Recently, voice search in smartphones is the best way for local promotion. Nowadays millions of customers use the local search to find the best local businesses in their area. First of all, you have to list your business in Google My Business listing. It’s free and very simple steps to register. You just have to add your contact details, address, website(If you have), opening and closing hours, etc. I am sure you will get the best results from this listing. Also, your brand name gets a higher rank in search engines. So, you can get more organic traffic to your business online. Similarly, this is another very important factor which shows the strong online presence of your business. Rather, customers can easily submit their business location in Google Map. It shows you are the genuine business owner. You have to create separate landing pages for trigger specific location. As a result, your business gets the top rank in local search. Also, more customers will attract to your business. This is a very important point because reviews are the golden key to enter the online competition. Nowadays all normal users check the online reviews of your business first. Reviews are on the type of trust and reputation of your service and product quality. It shows how genuine you are in online business and the user always wants the best service and quality product. They feel happy by knowing that they found the best service provider. You must have to do this task because it will improve your local online presence. Search engines track all the records of directories. If you are registered in well-known directories then search engines take attention and increase your search rank. Also, the customer can easily find you from these directories. Keywords are the most important in Local Search Engine Optimization and off-page SEO also. First of all, you have to find the best keyword from keyword finder like Kwfinder and then make an SEO friendly page. Google will crawl your page and your keyword will rank in search engines. When user will search for the keyword then your website will appear first and you will get more traffic to your website. This point makes your off-page SEO strong and you can increase your website rank in search engines. The simple definition of Link Building is “A link from another website to your site” is called Link Building. More links point to your website attract google and your google finds you are well known on the internet. Also, social sites are important for link building like Twitter, Facebook, Instagram, LinkedIn, and YouTube. Social sharing makes your brand importance and improve search results. “Unique and Quality Content is the king” to promote your brand online. If your content is good and very helpful you don’t have to share it. People will automatically make you famous by sharing it. Furthermore, large and detailed content is said to be effective and so you have to manage content properly. Even more, publish content regularly for better results and output. Finally, you have to apply for Google Search Console. Its a free tool to monitor your website and also you can track all the SEO movements of your website. If your website has an issue then this tool will show you the error report. You can know where is your mistake and resolve it to make your site better. Above all points shows the Local SEO Search Importance For Improve Your Brand Visibility Online. By following these steps you can get the awesome result and boost your website SEO ranking in search engines.